Drummer Taylor Mead connected the group, starting with a jam session and coming together to form Parvenu. The group’s name, which means a person of obscure origin who has gained wealth, influence, or celebrity; wasn’t the band’s original name. In the buildup to the EP release, the group had one of the songs played on 96.5 The Buzz’s “Homegrown” radio show and cracked 1,000 likes on its Facebook page. Having so much attention leading into the release meant a lot to Parvenu. Pierce said the group recorded “Not for the Faint of Heart” at Avenue Record Company in Grandview, Mo., with Matt Richards. The titles of each song on the EP really set the tone for what the album is – a straightforward look at Parvenu. Pierce explained that when it came to naming the title track, “Find My Way,” and “Slice of Heaven,” there wasn’t much beyond the title. The EP itself is a primal display of sonic power Parvenu delivers with a punch. While only three songs, there is enough variance to show the group isn’t made up of one-trick ponies. There are a lot of highs and lows, and McMillan’s vocals really shine, but it doesn’t stop there. The title song kicks off with a slow roll drum with the bass and guitar igniting the track and sending it to McMillan whose vocals quickly become the centerpiece. But it’s the subtleties that make it really great. The guitar work shines through “Not for the Faint of Heart,” with a breakdown at about halfway through that pays homage to so many greats of days gone by. Throughout the song, it seems as if there’s an organ under the music but Pierce explained it’s a bit trickier than that. The next track, “Find My Way,” again kicks off with the music in high gear. McMillan’s voice really shines, her vocal range giving the song a sense of versatility while the lyrics really dig into the struggles one faces on the journey of life. The Bjorgan again comes through and gives the song kind of a dirty, bluesy feel, which Pierce said the group was aiming for when they put it together. The third and final song of the EP, “Slice of Heaven,” has a great wholeness to it. The roaring guitars in the intro again show some influence from the ‘80s and McMillan’s vocals coupled with Pierce’s guitar work seem to emulate Halestorm. The lyrics relate to the journey on the highway of life, and the song is the perfect soundtrack for the drive. The song was the first the group wrote together but almost didn’t make it to the EP. 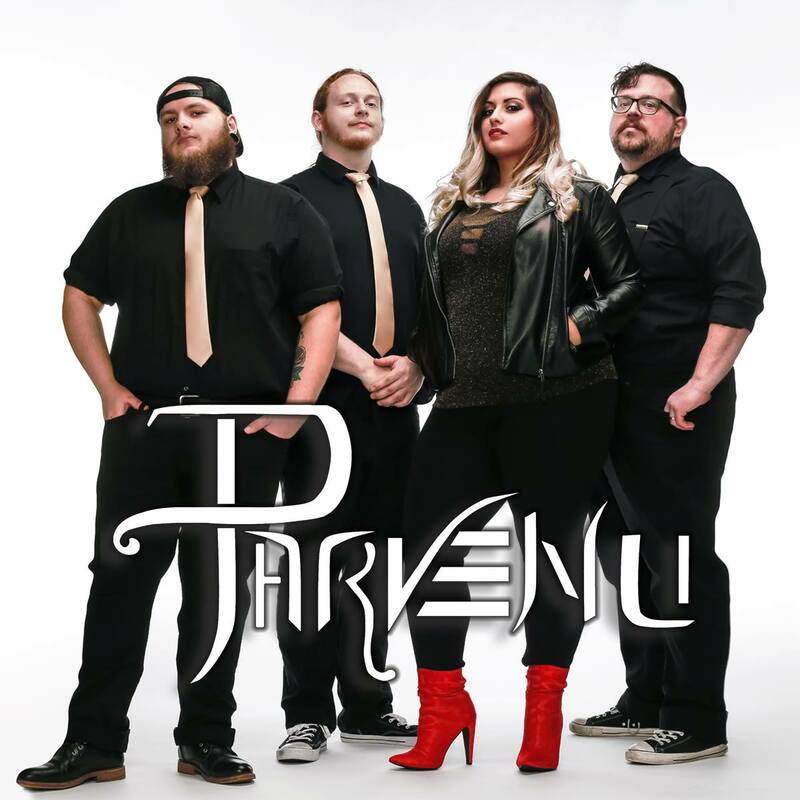 Parvenu hits the road next month with a show at Vaudeville Mews in Des Moines on March 30. “Not for the Faint of Heart” is available through most digital music outlets. Listen to it below via Spotify. For more on Parvenu, follow them on Facebook here.